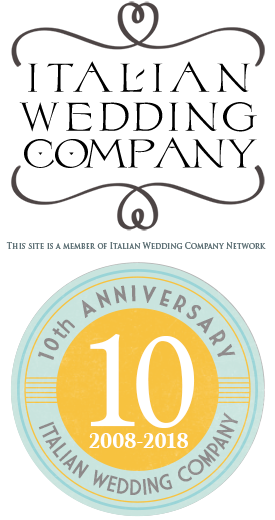 s we anticipated in our previous Just Married post we are back to you to tell you about another fabulous week of weddings on our Italian Lakes. Ready? Here you could see our lovely couples and some great shots… let’s see them in order! 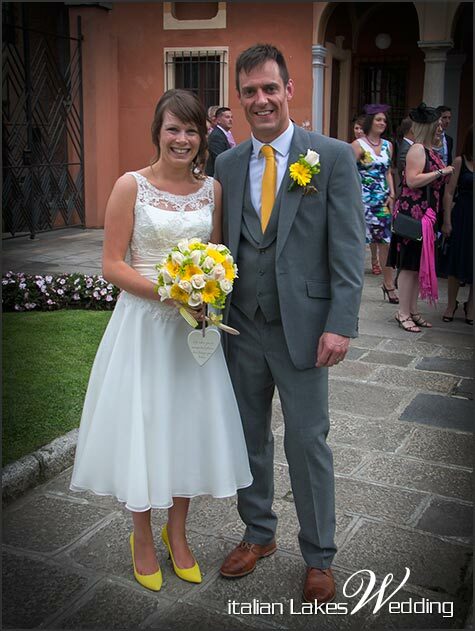 They came from UK to celebrate their wedding with family and friends on the shores of Lake Orta. Jacqueline wanted a relaxed yellow theme wedding. We will come back to tell you about this as we have some lovely shots to show you as soon as they will be ready! They had a different idea, meeting before on St. Julius Island just bride and groom for some romantic shots and then have their civil ceremony to Villa Bossi. Very sweet. We will come back with great shots for this moment. In the meanwhile you can admire how Jacqueline was pretty in her prom dress with yellow shoes and yellow bouquet created by La Piccola Selva. Our planner Valentina followed the event for them and after the ceremony she planned a fun boat trip they reached Ustaria Ca dal Rat for their joyful reception with lot of music and dances! 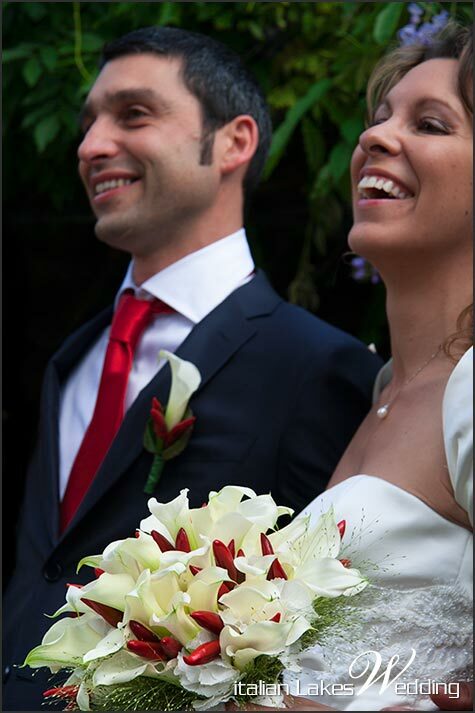 On the same day Jacqueline and Mat choose, Simona and Marco got married too. They had a wonderful orange themed wedding. From yellow to orange, from Lake Orta to Lake Maggiore! Simona and Marco opted for a religious ceremony in the panoramic church of Santuario della Bocciola on the hills of Lake Orta. 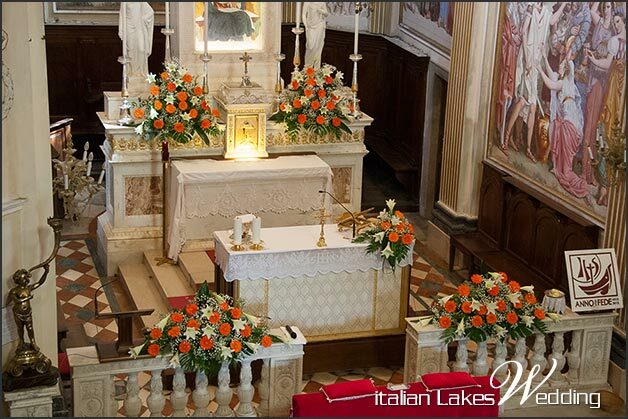 For their reception they all moved to Lake Maggiore in a luxury hotel in Stresa. 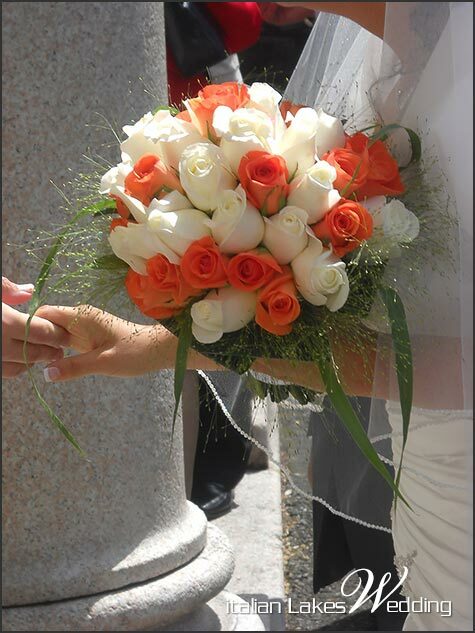 Simona wanted orange roses for her bouquet, orange gerberas for the church and centrepieces at Hotel Astoria in Stresa. Monika by La Piccola Selva was their floral designer and she supported them for all their decorations! The day after, 22nd of June, our planner Valentina followed another charming event. 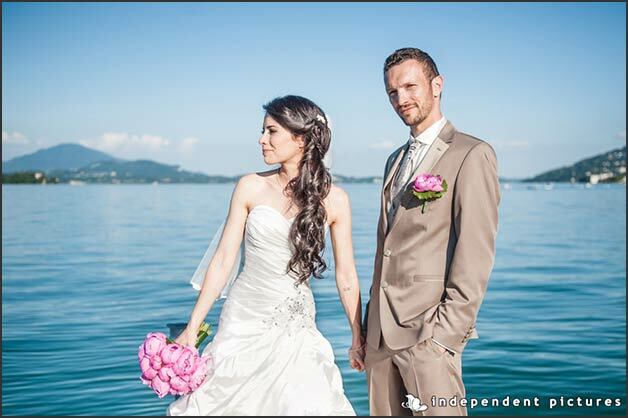 Rim and Joel got married on Lake Maggiore in the grounds of an amazing Hotel in Baveno. 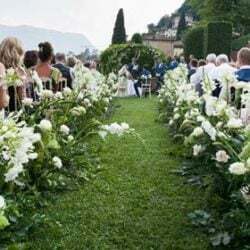 They wanted a romantic ceremony by the shores and Valentina suggested them to plan in in the gardens of the hotel just on the shores with a great view of whole Lake Maggiore. Ceremony was held almost all in italian even if bride and groom were French speaking – of course they understand Italian too. They thought that Italian is the most romantic language in the world! After the ceremony a long aperitif in the garden and lovely shots for Joel e Rim and then a fun reception in the lovely function room of the hotel overlooking the lake. Rim wanted deep pink peonies for bouquet, ceremony and centerpieces….she was simply beautiful in her wedding dress and we really think that fuchsia was the perfect choice for her. Thanks again to La Piccola Selva for lovely decorations and to Independent Pictures for great shots. On 24 June it was Kelly and Robert’s turn on Lake Como. Our planners Alessandra and Veronica followed the event for them, a very intimate event a wedding for two! 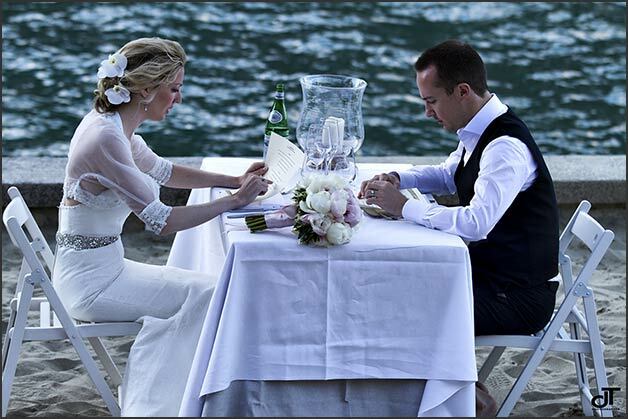 They got married at magic Villa del Balbianello, one of the most wanted venue for both ceremony and receptions on Italian Lakes. They moved then to a fun beach club on Lake Como for their celebratory meal. 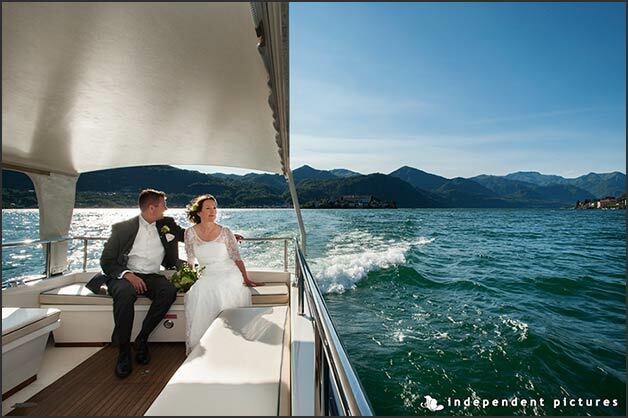 We cannot imagine anything more romantic than this… a romantic elope on Lake Como. Robert e Kelly spent a wonderful vacation in this area choosing one of the best suite of Hotel Tremezzo for their first night as newly wed! Aren’t’ they cute? A very special thank to Daniela Tanzi Photographer a very talented photographer who shared with us these beautiful shots! Back to Lake Orta, on the same day, 24 June, Valentina followed another event for us. 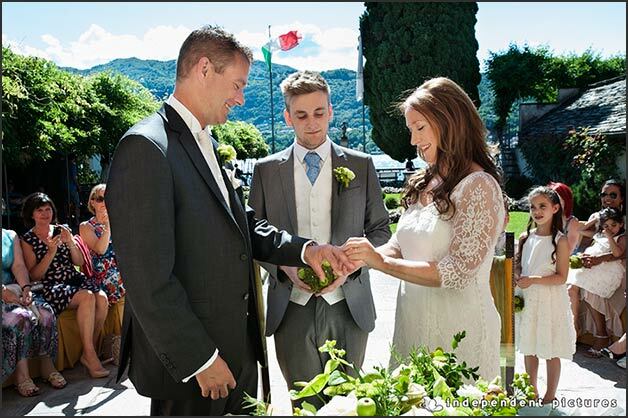 Sue and Carl got married on Lake Orta shores. They choose a civil ceremony too. Weather was simply stunning a wonderful clear and sunny day on Lake Orta. A blessed couple indeed. 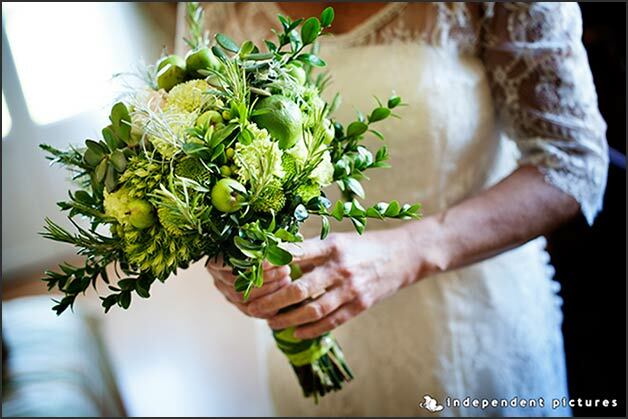 Sue wanted a total green theme for her decorations, you can appreciate her choice in the picture of her bouquet, with herbs, limes and little apples too! Same colours were also used for their reception to Ustaria Ca dal Rat. They reached it by a boat tour that all guests enjoyed a lot! Of course bride and groom reached them with a private boat after some shots on St. Julius Island. A lovely sweet party with a romantic set on Lake Orta! On 27 June Marta and Stefano planned a… surprise wedding! 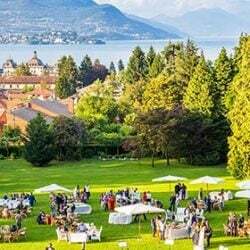 All guests (their closer family and friends) were invited to Villa Bossi with the excuse of party and tour on the Lake with a dinner at Ustaria Ca dal Rat. The appointment was set at the little jetty of Villa Bossi itself. You cannot imagine the surprise in the eyes of all parents when they saw Marta and Stefano arriving by rowing boat… and Marta was wearing a wedding dress!! Monika by La Piccola Selva studied for for our couple Villa Bossi arrangements and bridal bouquet. She used mini calls with roses and green hydrangeas… with a little touch red hot peppers! 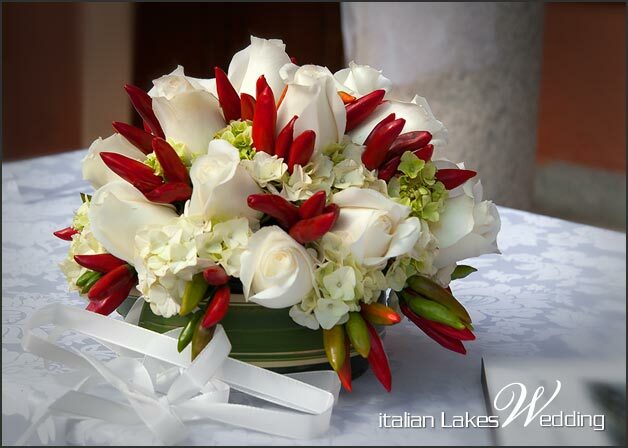 In Italy red hot peppers are a symbol of good luck and they can be perfect for wedding decorations as they are available all year long. On 28 june we got back on Lake Como with Cristiana and David. Alessandra and Veronica, our planners for Lake Como, followed the event. We are talking about a very special and sweet event for our bride and groom: a vow renewal. 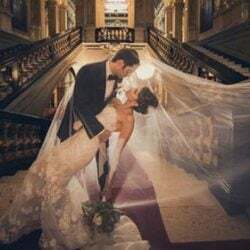 After 10 years Cristiana and David wanted to renew their vows in a special setting and they choose Grand Hotel Villa Serbelloni in Bellagio. 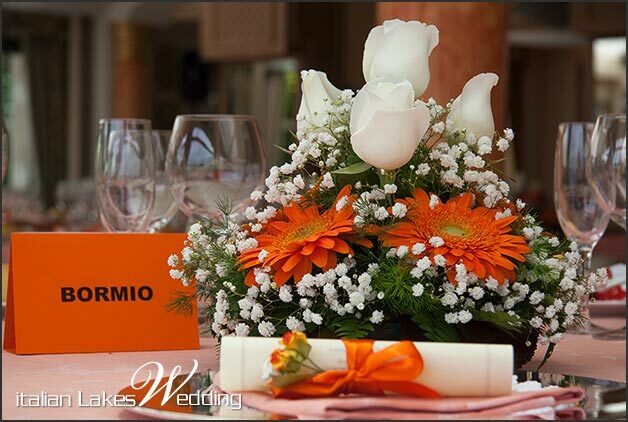 Floral decorations were similar to the ones they had on their wedding day 10 years ago with a special touch of colour called chocolate Cosmo. 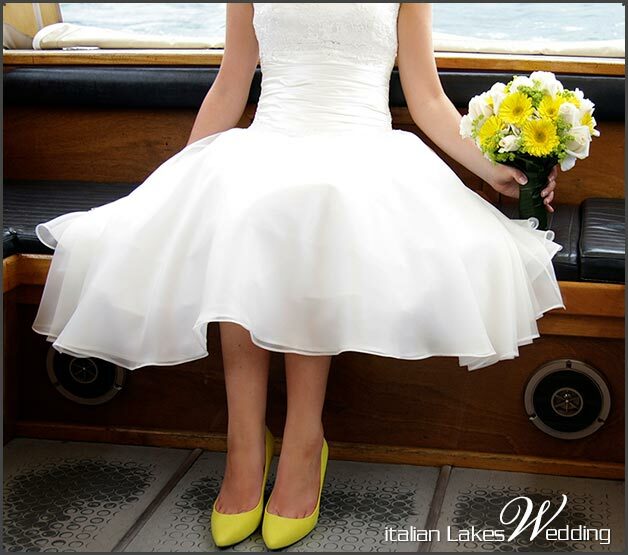 A vow renewal on Italian Lakes, isn’t it a great and romantic idea? 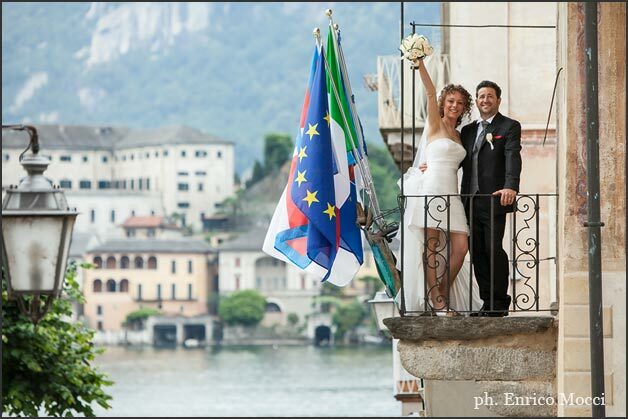 On 29 June we get back to Villa Bossi on Lake Orta for Marzia and Fabrizio’s wedding. It was surely one of the amusing event we had. Marzia seemed a top model in her short wedding dress with long veil and beautiful Vendela roses bouquet that Monika by La Piccola Selva created for her. A lovely aperitif to follow in Villa Gippini and a warm lunch on the terrace of Hotel San Rocco. Our PAOLO DRIGO SHOWMAN entertained the group all day. So fun! A deep thanks to ENRICO MOCCI, the official photographer of the day for these wonderful shots from Marzia and Fabrizio’s wedding! On the same day Mirella and Franco got married too. We want to close this post with the sweetest couple we had. A long love and romantic love story. They are not a very young couple but their wedding was one of the loveliest we ever seen. 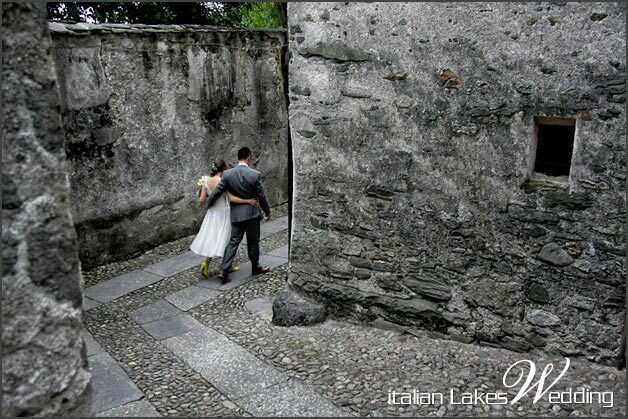 Once again a civil ceremony in the gardens of Villa Bossi on Lake Orta. After yellow, orange, fuchsia now it is time for bordeaux! Mirella choose this passionate colour for her bridal dress that was enriched by Monika by La Piccola Selva‘s ivory roses bouquet. 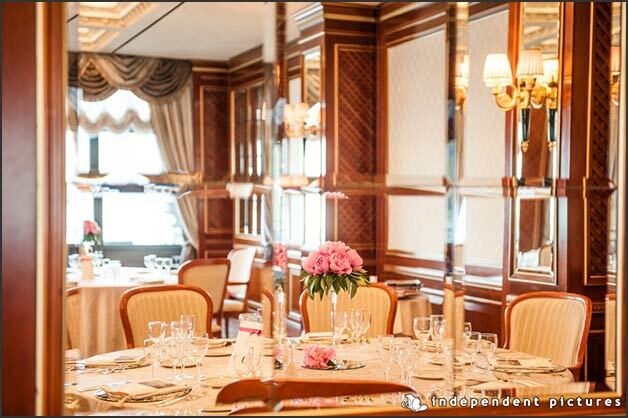 Other floral decorations were in bordeaux organza for Villa Bossi and Hotel L’Approdo where reception was held. Another fun night with PAOLO DRIGO showman-singer and imitator. Mirella and Franco’s wedding is the best way to close a rich post like this! Congratulations to you and all other couples who got married in these last few days and… to our readers… stay turned for more events! !